It's always a bit of a hit or miss when choosing a mascara, some turn out to be amazing and others disappointing. I always try a different mascara, I don't think I have ever bought the same mascara more than twice. 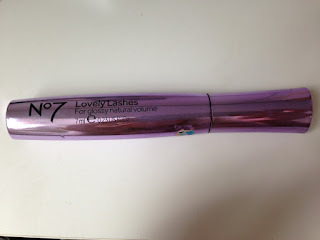 I had never tried a No7 mascara before so I decided to go for it, I choose Lovely Lashes as the last time I went to boots, one of the sales assistants was raving about it and the fact that it had argan oil in it. The argan oil is meant to help nourish your lashes, all the hair products with argan oil in them I have loved so I thought why not try a mascara with it in it.